How many Muslims are Islamists, that is, seek to apply the Shari'a (Islamic law) in its entirety and have a caliph as the worldwide authority? I proffered the estimate of 10 to 15 percent several days after September 11, 2001; this figure has been questioned, but it also has been quite widely accepted and repeated. In "Counting Islamists," I replied on October 8, 2008, to criticism of the 10-15 percent estimate of Islamists by building on and extending the facts recorded here. We know that there is a small group, and we don't know how big that is – it can be anywhere between 5 and 20 percent, from the people that I speak to – that Islam is their religion and who have a desire for a caliphate and to institute that in any way possible. They are not content enough to have their way of looking at the world, they want to put their way on everybody in the world. And again, I don't know how big that is, and depending on who you talk to, but they are certainly – they are willing to go to extremes. They are willing to use and they do use terrorism. A TESEV/KONDA survey released in September 2012 found that, when asked how they would define themselves, 18.9 percent chose the label "Islamist" while 15.6 percent chose "conservative." The Open Society Foundation-Turkey found in October 2012 that self-identified "conservatives" dropped from 16.6 percent in 2006 to 10 percent in 2012. MetroPOLL found in the second half of 2012 that self-identified Islamists make up 9.6 percent of the population and "religious conservatives" 6.4 percent. A Pew Research poll finds high rates of support for Islamic law. 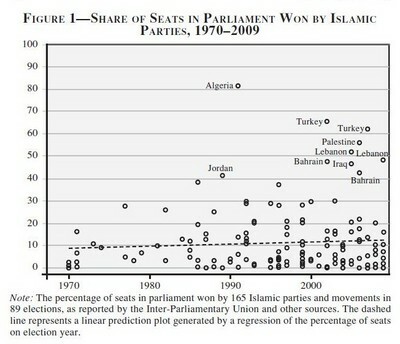 Across all 89 parliamentary elections of the past forty years in which an Islamic party participated, the median performance was 7.3 percent of the vote and 6 percent of the seats. If we combine the tallies of all the Islamic parties that participated in a given election, the median Islamic party performance is 15.5 percent of votes and 15 percent of seats. (1) The 15.5 percent of the vote fits nicely with my estimate of 10-15 percent of Muslims having Islamist views. (2) Note how those elections in which Islamists do well get disproportionate attention, implying that Islamists do not fare as well than their reputation would have it. (3) 15 percent of the vote is pretty meager and suggests that fair elections would not bring Islamists to power in Muslim-majority countries. Comment: Shibley changed the topic. I spoke about percentages of Muslims who support Islamism not who support "al-Qaida's message of confronting the United States." One can be an Islamist and not support Al-Qaeda's anti-American violence; one can also be not an Islamist and support the violence. It's a different issue and Shibley falsely conflates them. Indonesian poll 2006: A survey conducted by the Indonesian Survey Circle, a private pollster, finds that almost 70 percent of Indonesians (including non-Muslim citizens) back the current secular system of Pancasila. Given that some 85 per cent of Indonesians are Muslims, and presuming that only Muslims would want an Islamic order, that points to about one-quarter of the country's Muslims wanting something different. The poll also found about 55 percent opposing law, with stronger opposition to some parts of the Shari'a. Object to stoning for adultery: 63.3 percent. Oppose the death penalty for Muslims converting from Islam: 71.2 percent. Oppose making women wear Muslim dress: 77 percent. Against cutting off the hand of a thief: 77.3 percent. In order to investigate characteristics that distinguish Muslim world residents who are potentially prone to extremist views, we divided respondents from the region into two groups. Classified as political radicals were those who met the following criteria: 1) they felt the terrorist attacks of Sept. 11, 2001, were "completely justified", and 2) they indicate that they have an "unfavorable" or "very unfavorable" opinion of the United States. Those who did not say the attacks were completely justified were termed moderates. The "radical" group represents about 7% of the total population across the 10 countries included in the study, ranging from a high of 26% in Egypt to a low of 1% in Morocco. "Who Speaks for Islam? What a Billion Muslims Really Think," by John Esposito and Dalia Mogahed. (May 3, 2006) Apr. 9, 2008 update: This research has appeared as a book by Esposito and Mogahed, Who Speaks for Islam? What a Billion Muslims Really Think. Martin Kramer notes in "Dr. Esposito and the seven-percent solution" that this 7 percent results from manipulation: The political radicals include only those who deemed the 9/11 attacks "completely justified," as opposed to those who thought them just "largely justified." Kramer points out that in November 2006, Esposito and Mogahed gave a different definition of radical: "Respondents who said 9/11 was unjustified (1 or 2 on a 5-point scale, where 1 is totally unjustified and 5 is completely justified) are classified as moderates. Respondents who said 9/11 was justified (4 or 5 on the same scale) are classified as radicals." Redefining 4s from radical to moderate brought the percentage of radicals to just 7 percent. May 12, 2008 update: Robert Satloff reveals more hanky-panky behind these statistics. At a luncheon he hosted for Mogahed at Washington Institute for Near East Policy on April 17, she replied to a question about the distinction between the 7 percent who consider the 9/11 attack "completely justified" and those in the other 93 percent who answered that the attack was "partly," "somewhat" or "largely" justified? Are such respondents truly moderates? Mogahed used pollster jargon in her reply, which Satloff summarizes as follows: "Mogahed publicly admitted they knew these people weren't moderates but they still termed them so. She and Esposito cooked the books and dumbed down the text." The evidence showed there to be not 7 percent radicals but 13.5 percent radicals (the 4s and 5s combined together). Margaret Nydell: "The militant Muslim groups cannot represent even 1 percent of Muslims in the United States (that would be 50,000) or the world (that would be 15 million). If that were true, we would be overrun with wild-eyed fanatics. Islamists who resort to violence add up to less than one tenth of 1 percent." (Understanding Arabs: A Guide for Modern Times, 4th ed., International Press, 2005, p. 104) Comment: Nydell makes the inexplicable mistake of equating Islamists with terrorists, as though all of the former are the latter. And this from a professor at Georgetown University. Some unsolicited advice for her: stick closer to linguistics, in which you got your degree, and stay clear away from politics. Husain Haqqani, author of Pakistan: Between Mosque and Military (Washington, DC: Carnegie Endowment for International Peace, 2005) writes on p. 1: "Pakistan's Islamists made their strongest showing in a general election during parliamentary polls held in October 2002, when they secured 11.1 percent of the popular vote." Otto Schily, Germany's interior minister, spoke today at the release of the 2004 Verfassungsschutzbericht, the annual report by the domestic security agency that surveys Germany's extremist movements, as I have written, in a "frank and constructive way." Schily announced that, at the end of 2004, there were exactly 31,800 Islamist radicals resident in Germany, or 1 percent of the Muslim population of Germany. (May 15, 2005) May 22, 2006 update: The number has increased to 32,100 Islamists in Germany for 2005, says the Verfassungsschutz. Hisham Kabbani, head of Islamic Supreme Council of America: 5 to 10 percent of American Muslims are extremists. (Steven Vincent, "Where Are the Moderate Muslims?" The American Enterprise, April/May 2005, p. 27).